Here's a real beauty of a pen pouch, at a terrifically inexpensive price (compare with other pouches being sold on the net) designed to hold two pens, with a mesh inner lining (they *appear* to be soft vinyl -- it's *very* hard to tell that they're not leather). Available in black only, this pouch easily holds two of your favorite pens, even if oversized -- just click on the photos to expand them). The tongue folds over and is secured by a leather loop. The perfect way to protect your important traveling companions! The pen case measures 5" closed (without pens inside) and 10" with flap open. Although not real python skin, these faux leather cases actually have a snakeskin-like texture. These are designed to fit narrow to medium girth pens, and will not fit oversized ones. The tongue folds over and is secured by a leather loop. The perfect way to protect your important traveling companions! Available in Gray or Brown, the pen case measures 6" closed (without pens inside) and 11" with flap open. Here's a gorgeous leather pen case, which easily handles two oversized pens, the DUKE Beijing Opera and the DUKE Dragon's Offspring. 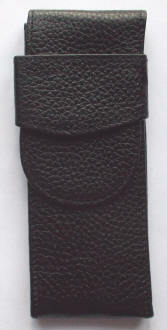 This is the same pen case included with many of the upper-end and limited edition DUKE pens.